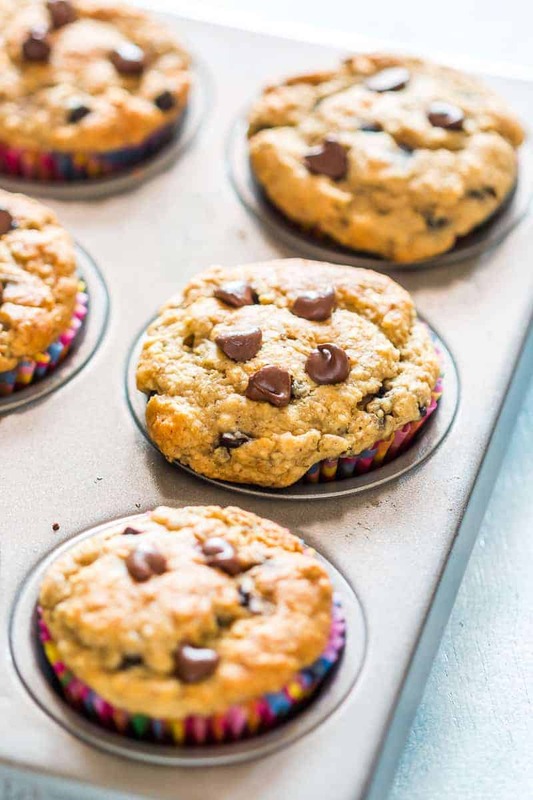 Healthy Oatmeal Banana Chocolate Chip Muffins are super easy, extremely soft and fluffy; have almost no flour, and are perfect for breakfast! It’s Monday morning and I’m up bright and early to talk to you about these healthy oatmeal banana chocolate chip muffins. Because why not? We need a mix of everything on Monday mornings – easy breakfast muffins and trying to get to work on time. I know some of you must be like – you don’t have to go anywhere. But my Monday mornings are crazy too. Getting everybody’s breakfast ready (designated cook obviously), making sure lunches are packed, coffee is still hot, workouts done for the day. And when I have these oatmeal breakfast muffins ready, I’m one step closer to pushing everybody out of the door. I’ve made these muffins before with cranberry. Those are from the days when my photography sucked as you can see but they tasted just as amazing. Since then I’ve made these a gazillion times and have tweaked the recipe a bit to make them better (as if they needed that!). But better. 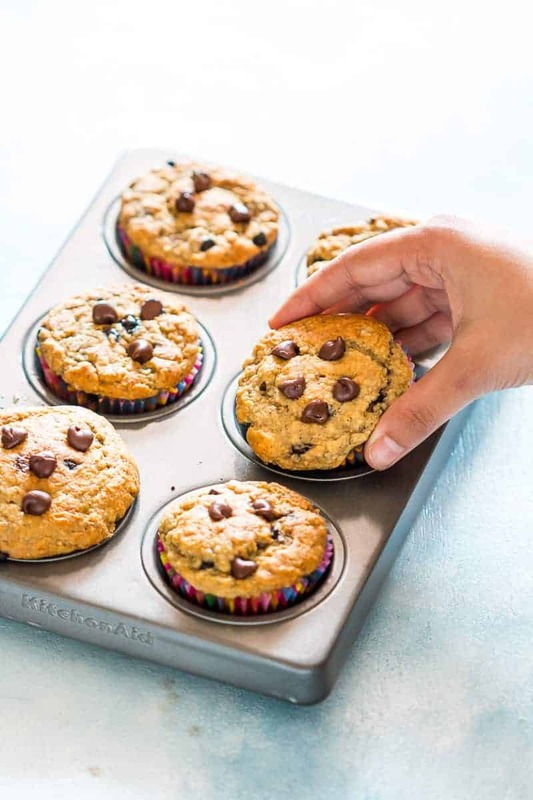 I love making these muffins in my KitchenAid muffin tins because they are seriously non stick – with liners or without! And I hate when muffins get stuck to the bottom of the tins, don’t you? I know you probably have questions because oatmeal in muffins? Isn’t that gloopy, slimy ingredient meant for porridge? But let me give this a try. 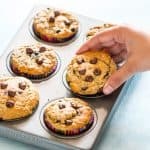 Are Oatmeal Banana Chocolate Chip Muffins Healthy? These ones are! Because they use oatmeal flour which has way more fiber than regular all purpose flour. They have very little flour in them, a tiny amount of honey to sweeten these, which I’m sure you can substitute with pureed dates, and a little bit of butter (which I’m not against). If you are extremely conscious about sugar, you can use dark chocolate chips or skip them altogether and swap them with something else. Since I spoke about oatmeal flour, I know you have another question now. How do I make Oatmeal Flour? This ones even simpler. All you need to do is take oats (any variety works), and grind it in your mixer grinder or food processor till it resembles a fine powder . 1 cup of oats will yield approximately a cup full of oat flour. Adding oats can actually make muffins less dense which is why I love them so much. Can I use raisins, cranberries or other add-ins in these muffins? Absolutely. Oatmeal Banana Raisin Muffins instead of chocolate chip would work just as well. Or cranberry like I’ve tried before. I even add walnuts, pecans or almonds sometimes to these with chocolate chip (don’t leave that out) and they only make the muffins taste better. So feel free to add your favourite flavours and make these oatmeal banana chocolate chip muffins your own. And don’t skimp on the chocolate chips. They are the beeessssst! I’m a Culinary Council member with KitchenAid India and I love and recommend their high quality products. Pre-heat oven to 175 degree Celcius. Grease and line a 12-muffin tin and set aside. In a bowl, mix together oat flour, milk, bananas and vanilla extract and let the mixture sit for 10-15 minutes. This will help soak the oat flour so that the muffins are not dry. In another bowl, combine flour, baking powder, baking soda, cinnamon powder (if using) and salt. Set aside. In a different bowl, whisk together butter and honey and set aside. You’ll now have three different bowls. Once the oat mixture has soaked for 10 minutes, add the butter mixture to it. Mix well. Finally add the flour mixture and mix until just combined. 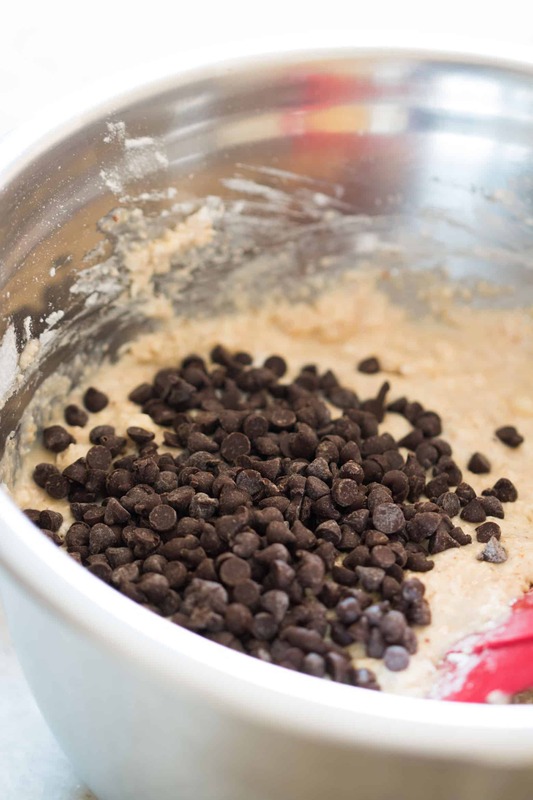 Fold in the chocolate chips and scoop mixture into lined muffin tins. These muffins don’t rise too much so you can fill till almost the top (leaving about 1/4 inch space from the top). Bake for 18-20 minutes until a skewer inserted into the middle comes out clean. Once baked, let the muffins cool for a few minutes before turning them out on a wire mesh. Consume within 2-3 days. *This page contains affiliate links. If you buy from these links, I may earn a small income. I love your additions! Thanks Erin! Can these muffins be placed in the freezer to keep and spread out over a week or two time period? Wow wish to bake these lovelies …happy with al the ingredients except the al purpose flour /maida…can this b substituted with any other healthier option ? Thanks Deepa, you can substitute this with atta or whole wheat flour. I made these a few says ago using bisquik gluten free mix. we loved them but they needed a little more liquid–maybe more milk in the oatflour stage? Hey! Since you substituted with bisquik gluten free mix, its possible that it needs a little more liquid. You can start by adding a tablespoon or two of milk extra and see if it makes them better. Glad you liked them!